With an up-tempo jazz orchestral score, light tone and screwball humour, you’d be forgiven for almost thinking that A Royal Night Out was a more regal version of films like Bringing Up Baby or It Happened One Night. Instead, it’s a harmless and amusing ride based on supposedly true events – it’s VE Day in London, with the Second World War having come to a close and the streets filled with people celebrating their victory over the Germans. 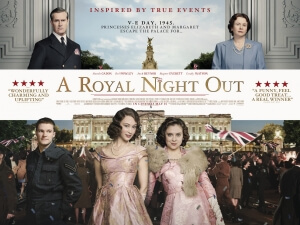 Behind the quiet and reserved walls of Buckingham Palace, Princesses Elizabeth (Sarah Gadon, bringing a strong sense of maturity and elegance as the future Queen) and especially Margaret (Bel Powley, a giddy and adorable counterpart) yearn for the chance to go and celebrate with their people, which is eventually granted by their father King George VI (Colin Firth Rupert Everett, who gives dignity and a fragile composure to the distressed former Monarch) to the dismay of their mother Elizabeth (Emily Watson, disappointingly not given much to do except pout and be reserved about it). From there, hijinks ensue with the “incognito” Princesses giving their distracted chaperones the slip and heading out to party like there’s no tomorrow, while coming across a series of characters and obstacles along the way, and all that good stuff. Anyone expecting a challenging insight to the lives of the wartime royalty will be better off re-watching The King’s Speech instead; this is much more of a comedic romp that is campy and frightfully silly all at the same time. It’s unlikely that the scenarios and people that the Princesses encounter actually occurred in real life, and even the idea of them going out into the public to celebrate the end of the Second World War at all is a popular myth amongst historians, but writers Trevor de Silva and Kevin Hood just seem to go with it and let their restrictive imaginations run wild with the comedic possibilities it suggests. Margaret, for example, ends up coming face to face with a suave pimp (a moustachioed Roger Allam) in a seedy Soho club, while “Lilibet” continuously seeks the assistance of an embittered bomber named Jack (Jack Reynor) who – whoops! – has a particular dislike for the royals. Sure, it’s all a bit contrived but that’s the essence of the movie: it’s a fictional “what if?” scenario that’s clearly an invention of the writers’ collective minds to accompany this strange but affirming story that may or may not have really happened. The wackiness certainly brings up memories of the 40s-era screwball comedies, complete with a punchy jazz orchestral score, and when it can be funny it can certainly be that. Even if you don’t at all buy that the Princesses would even consider getting into these kinds of scraps, the imagined situations are portrayed in such an entertaining manner that you can’t help but admire them. Powley is responsible for a lot of the film’s humour, and the 23-year-old actress has impeccable comedic timing that makes her a talent worth watching. If she can make Princess Margaret of all people a genuinely entertaining character, then who knows what else she can do. However, when the film tries to reach for hard-hitting drama, it doesn’t fit quite as well with the film’s overall tone. This is because a lot of it is dedicated to laying out the backstory of Jack, a character who we never really warm to due to his snarky and chippy attitude, especially when publically declaring his hate for the royals (in front of – oops! – the Queen to be). Eventually, we do of course see that under his hard exterior lies a man with a heart of gold, but it doesn’t work out as well because his overall character arc simply doesn’t fit with the more light-hearted tone of the movie. It’s a bit of a downer, and just makes us want to go back to the lavish celebrating going on elsewhere. The ending, too, seems to drag on a bit too long, finally concluding with a kiss that is for some reason shown off-screen, possibly so as not to disappoint or offend the one critic of A Royal Night Out that truly matters – but seeing how it is an inoffensive but charming romp designed mainly for older viewers, we reckon that Her Majesty probably won’t mind all that much. A Royal Night Out is a harmless comedic romp that takes extreme creative liberties with this supposedly real-life event, and has fun with how far it can go with its screwball farcical tone – mostly thanks to Bel Powley’s lively turn as Princess Margaret – even though it doesn’t amount to any ground-breaking.